FAITH LAPIDUS: Now, the V.O.A. Special English program, AMERICAN STORIES. 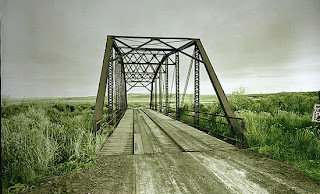 Our story today is called, "An Occurrence at Owl Creek Bridge. " It was written by Ambrose Bierce. The occurrence, or event, in our story takes place during the Civil War of the eighteen sixties between the American states of the north and the states of the south. A group of soldiers is hanging a southern farm owner for trying to stop northern military movements across the Owl Creek Bridge. In the last moments of his life, the southern prisoner dreams he has escaped. And everything that happens in the story is really the images in the prisoner's mind just before he dies. Here is Shep O’Neal with our story. SHEP O’NEAL: A man stood on a railroad bridge in Alabama looking down into the swift waters of the Owl Creek River below. The man's hands were tied behind his back. There was a rope around his neck. The rope was tied to part of the bridge above him. Three soldiers of the northern army stood near the prisoner, waiting for their captain's orders to hang him. Everybody was ready. The prisoner stood quietly. His eyes were not covered. He looked down and saw the water under the bridge. Now, he closed his eyes. He wanted his last thoughts to be of his wife and children. But, as he tried to think of them, he heard sounds -- again and again. The sounds were soft. But they got louder and louder and started to hurt his ears. The pain was strong. He wanted to shout. But the sounds he heard were just those of the river running swiftly under the bridge. The prisoner quickly opened his eyes and looked at the water. "If I could only free my hands," he thought. "Then I could get the rope off my neck and jump into the river. I could swim under the water and escape the fire of their guns. I could reach the other side of the river and get home through the forest. My house is outside of their military area, and my wife and children are safe there. I would be, too…"
While these thoughts raced through the prisoner's mind, the captain gave the soldiers the order to hang him. A soldier quickly obeyed. He made the rope firm around the prisoner's neck. Then he dropped him through a hole in the bridge. As the prisoner fell, everything seemed black and empty. But then he felt a sharp pain in his neck and could not breathe. There were terrible pains running from his neck down through his body, his arms and his legs. He could not think. He could only feel, a feeling of living in a world of pain. Then, suddenly, he heard a noise…something falling into the water. There was a big sound in his ears. Everything around him was cold and dark. Now he could think. 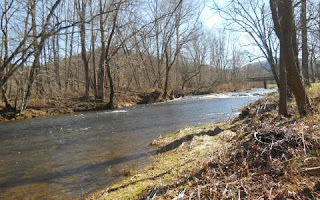 He believed the rope had broken and that he was in the river. But the rope was still around his neck, and his hands were tied. He thought: "How funny. 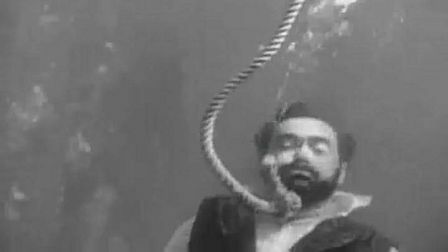 How funny to die of hanging at the bottom of a river!" Then he felt his body moving up to the top of the water. The prisoner did not know what he was doing. But his hands reached the rope on his neck and tore it off. Now he felt the most violent pain he had ever known. He wanted to put the rope back on his neck. He tried but could not. His hands beat the water and pushed him up to the top. His head came out of the water. The light of the sun hurt his eyes. His mouth opened, and he swallowed air. It was too much for his lungs. He blew out the air with a scream. Now the prisoner could think more clearly. All his senses had returned. They were even sharper than before. He heard sounds he never heard before -- that no man's ears ever heard -- the flying wings of small insects, the movement of a fish. His eyes saw more than just the trees along the river. They saw every leaf on the trees. And they saw the thin lines in the leaves. And he saw the bridge, with the wall at one end. He saw the soldiers and the captain on the bridge. They shouted, and they pointed at him. They looked like giant monsters. As he looked, he heard gunfire. Something hit the water near his head. Now there was a second shot. He saw one soldier shooting at him. He knew he had to get to the forest and escape. He heard an officer call to the other soldiers to shoot. The prisoner went down into the river, deep, as far as he could. The water made a great noise in his ears, but he heard the shots. As he came up to the top again, he saw the bullets hit the water. Some of them touched his face and hands. One even fell into the top of his shirt. He felt the heat of the bullet on his back. When his head came out of the water for air, he saw that he was farther away from the soldiers. And he began swimming strongly. As he swam, the soldiers fired their rifles. Then they fired their cannon at him. But nothing hit him. Then, suddenly, he could not swim. He was caught in a whirlpool which kept turning him around and around. This was the end, he thought. Then, just as suddenly as it had caught him, the whirlpool lifted him and threw him out of the river. He was on land! He kissed the ground. He looked around him. There was a pink light in the air. The wind seemed to make music as it blew through the trees. He wanted to stay there. But the cannon fired again, and he heard the bullets above his head. He got up and ran into the forest. At last, he found a road toward his house. It was a wide, straight road. Yet it looked like a road that never had any travelers on it. No farms. No houses on its sides, only tall black trees. In the tall black trees, the prisoner heard strange voices. Some of them spoke in words that he could not understand. His neck began to hurt. When he touched it, it felt very large. His eyes hurt so much that he could not close them. His feet moved, but he could not feel the road. As he walked, he was in a kind of sleep. Now, half-awake, half asleep, he found himself at the door of his house. His lovely wife ran to him. Ah, at last. He put his arms about his beautiful wife. And just then, he felt a terrible pain in the back of his neck. All around him there was a great white light and the sound of a cannon. And then…then…darkness and silence. The prisoner was dead. His neck was broken. His body hung at the end of a rope. It kept swinging from side to side. Swinging gently under a hole in Owl Creek Bridge. 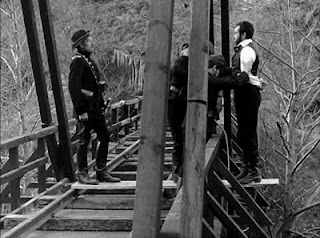 FAITH LAPIDUS: You have just heard the American story "An Occurrence at Owl Creek Bridge." 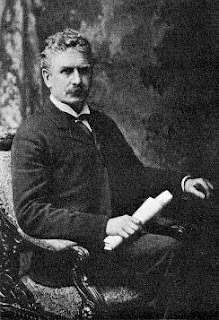 It was written by Ambrose Bierce. Your storyteller was Shep O’Neal. Listen again next week at this same time for another American story told in Special English on the Voice of America. This is Faith Lapidus. 1. The word "occurrence" means ________________________________ . 2. In the story, the man's beautiful wife runs towards him. He puts his arms around her. Next, ______________________ . 3. When the prisoner lands in the water, the reader thinks that ___________________ . 4. "An Occurrence at Owl Creek Bridge" was written about a soldier in the ______________________ . 5. The author's intention with this story was to show _____________________ . 6. The road towards his house that looked like it never had any travelers on it ____________________ . 7. When the soldiers saw that the prisoner was swimming in the river, they _______________________ . 8. The prisoner was hanged because he was accused of ____________________. 9. As the prisoner stood waiting to be hanged, he wanted his last thoughts to be about ______________________ . 10. If the prisoner could escape he thought he would be safe in his house because ______________________ . d: it was a house that belonged to the enemy's captain.